Accessing global markets from your location. Strategic B2B partnerships, a click away. Trade confidently without any hassles. 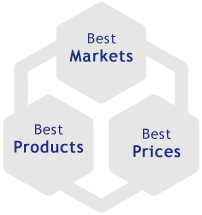 eFresh.com is a global marketplace for fresh product industry. eFresh provides buyers with a secure trading platform to connect with verified suppliers. Fresh Products from Verified Suppliers from 30 countries.